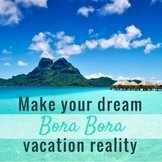 Dreaming of a tropical vacation on Bora Bora beaches? 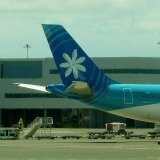 Imagine glimmering, turquoise, lagoon water...for as far as your peripheral vision can see. Surround it with white sandy beaches, fringed by a ring of vivid green, palm studded motus. Turn around 180 degrees. More electric blue, calm water, edged by powdery white beaches. 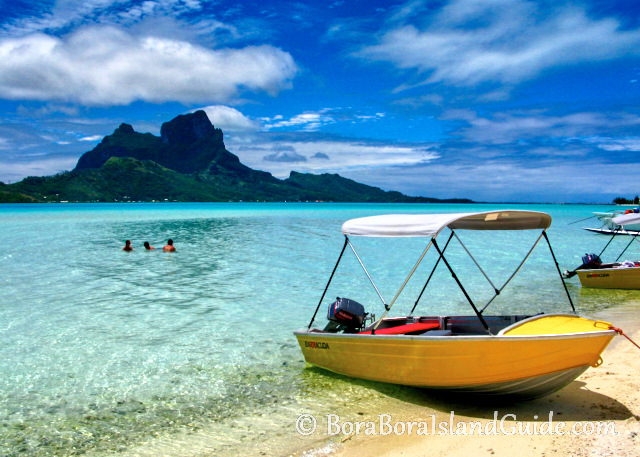 And behind them, rising mysteriously out of the sand...exotic Bora Bora Island. 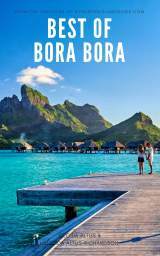 Are the Bora Bora Colours REAL? 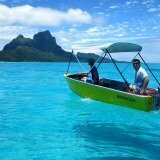 When I first showed my Bora Bora photos to friends, everyone asked me if they had been 'photo-shopped.' The answer is 'No'. The water really is that color, only better, when you are there! The vivid shades of emerald, turquoise, azure and royal blue are mesmerizing! The beaches here are even more beautiful than pictures can convey. 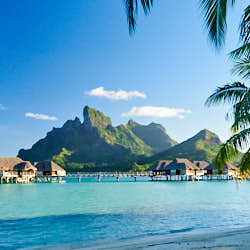 They are the reason I have become a Bora Bora Island addict. 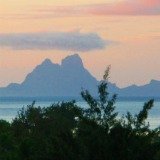 Ideal weather means Tahiti beaches offer pleasure all year. And some people actually move here. I was buying some pretty shell jewelery at a store in Bora Bora and chatted to the sales assistant. Her accent told me that she was an Australian. 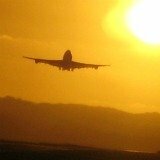 She came for a holiday, fell in love with the beaches (and a man)...and never went home. You can see why! 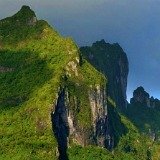 The incredible pictures of these most photographed Tahiti beaches are what lures most of us to Bora Bora. And the brilliant beaches, wrapped around the sheltered circular lagoon will offer an ongoing invitation to linger, throughout your stay. The unique geography creates tranquil water with temperatures as tempting as the colors. In winter the average is 79°F (26°C) and in summer it's an unbelievable 84°F (29°C). 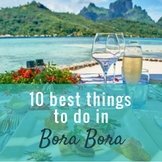 Make sure you know what to take to Bora Bora to make the most of your Bora Bora beach vacation. 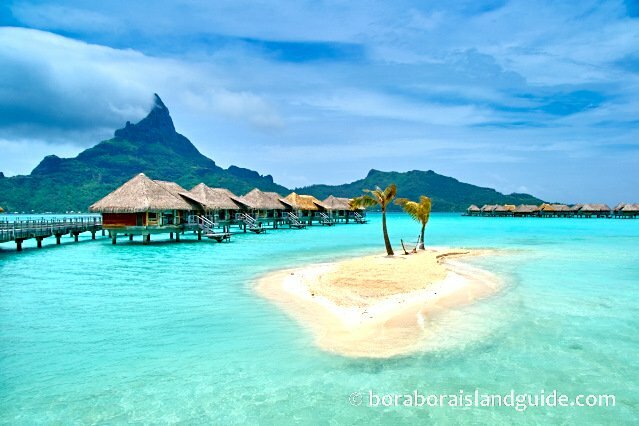 Imagine Owning a Bora Bora Beach! 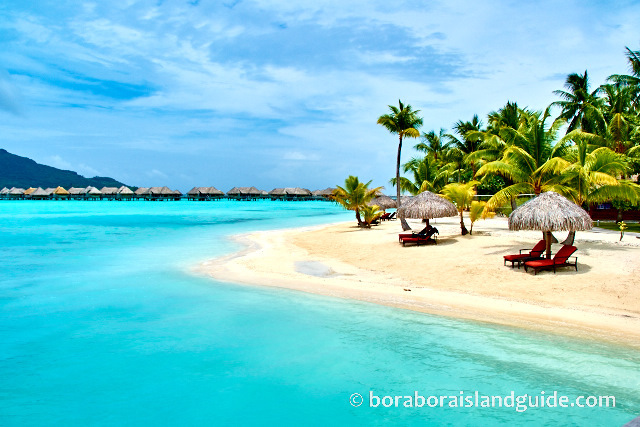 Some of the most picturesque stretches of sand are settings for luxurious Bora Bora Beach Resorts. 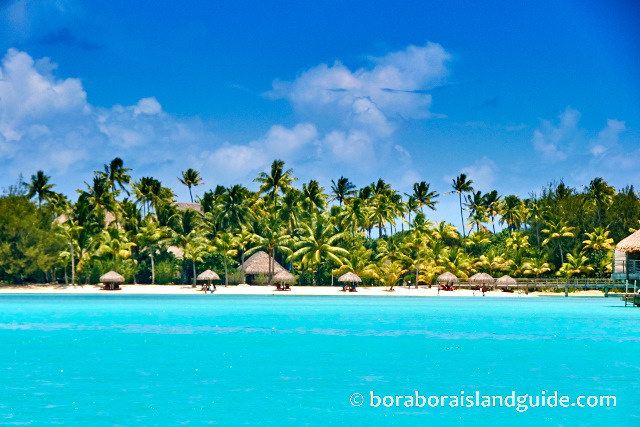 Most of the Bora Bora beaches are privately owned, except for Matira Beach. 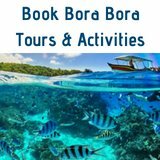 When you take a lagoon tour your guide will include a visit to a private motu, and this gives you access to some very romantic, pristine beaches out on islets. 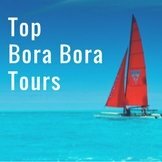 Our favourite tour is with Marona of Lagoon Service tours. 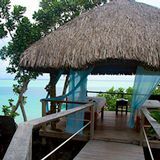 He took us to his own tiny motu home where we snorkeled from his beach and ate luscious freshly prepared island fruit. 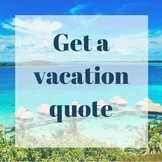 Your choice of resort is very important because the majority of your beach time will be enjoyed there gazing at the gorgeous lagoon. Give careful thought to what beach ambience and facilities each offers. 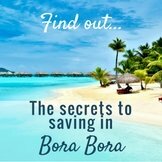 My experience is that most of the Bora Bora resorts have such beautiful beaches that you won't want to go anywhere else. 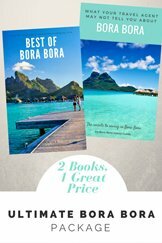 So choose the best Bora Bora beach resort you can. 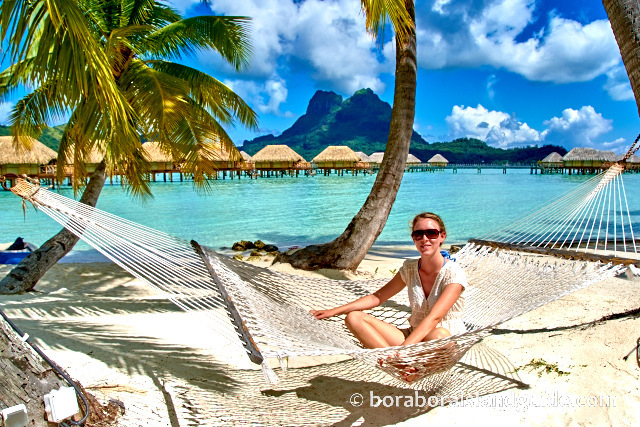 Matira Beach is a mile of exquisite sand at the southern tip of Bora Bora Island. 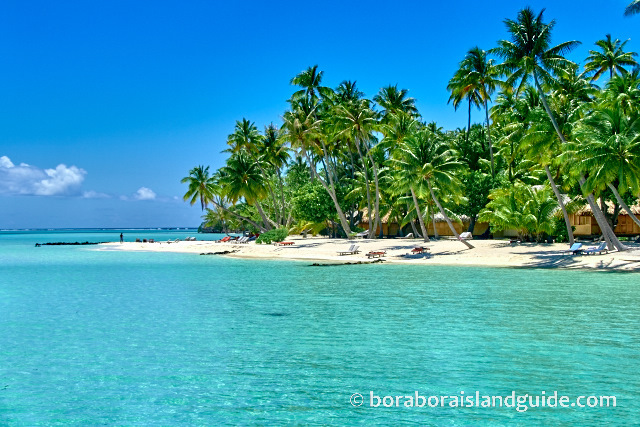 Often described as the most beautiful beach, it has a fun atmosphere that offers natural shade from palm trees. 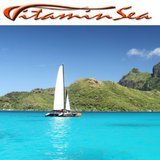 The white sand slopes gently into a warm, shallow, flat lagoon that is very safe for swimming and snorkeling. As it looks to the west it is a favorite place to watch the sun set over the watery horizon. 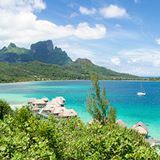 Have a look at the other gorgeous Tahiti beaches you might want to visit on your Bora Bora vacation!